Printing while you wait on seasonal apparel, tee shirts, pocket shirts, sleeveless ladies’ tops, sweatshirts and hoodies. Blanks available for sale. Flags, hats and biker apparel during events. 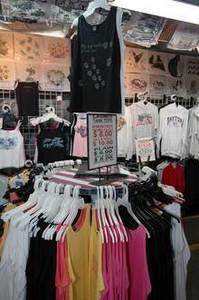 100’s of transfers to choose from – daily biker, southern, military, wildlife, sea life and Daytona Beach designs. You can also bring us your own apparel and we will print it for you. 26 years of serving our customers! Fully guaranteed and our motto is ‘Tees to Please’.